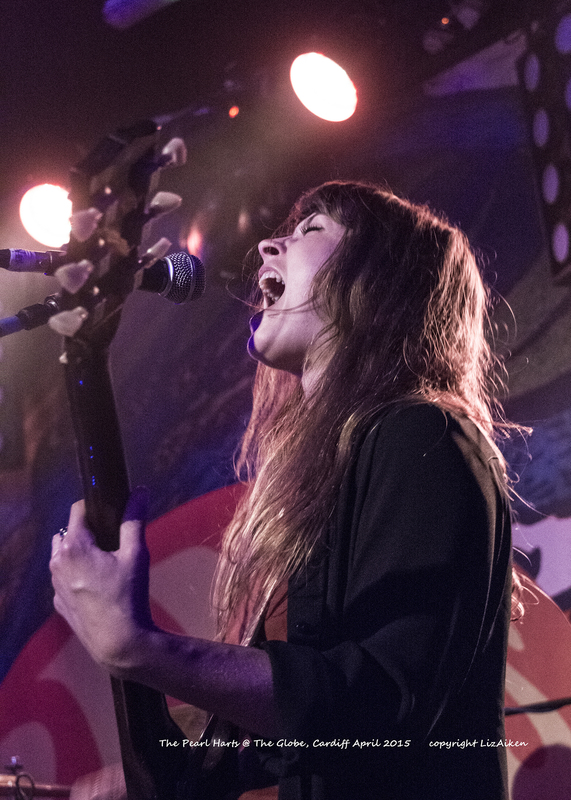 On Shakespeare’s birthday in the land of dragons the audience were wowed by a triplet of energetic, stylish and imaginative bands who entertained and delighted the packed house with rock music that sparkled and hit every chord. Guitar / Loops) and Sara (drums / vocals/ samples). 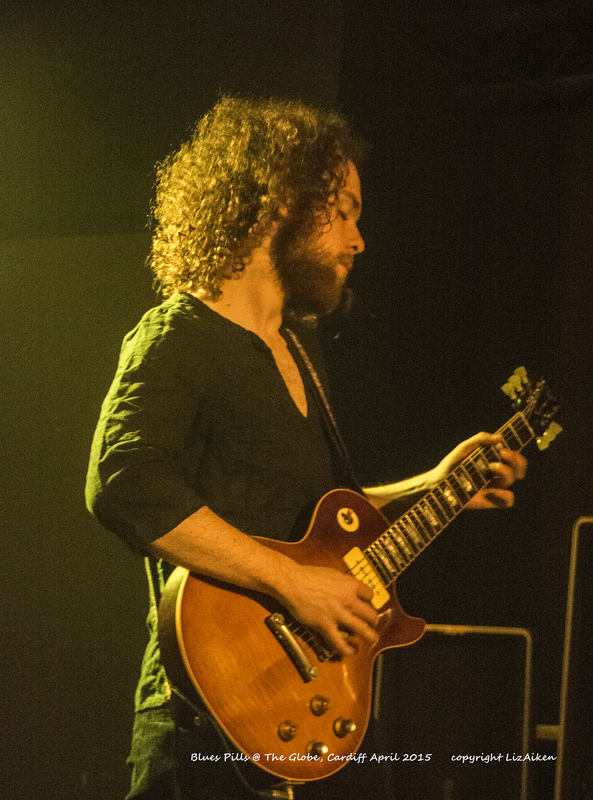 Tonight was an opportunity to introduce the band to Wales, with Wolf Eyes full of strength, and the opportunity to showcase their single Skeleton Made of Diamonds; there being a deep blues-style riff, which underpins the robust drumming and the harmonization that blends and shapes the lyrics that are about potency in the face of hardship. This is a duo with their mix of traditional instruments with modern gadgets melding together they should be a big noise on the scene Sara & Kirsty definitely deserve it. 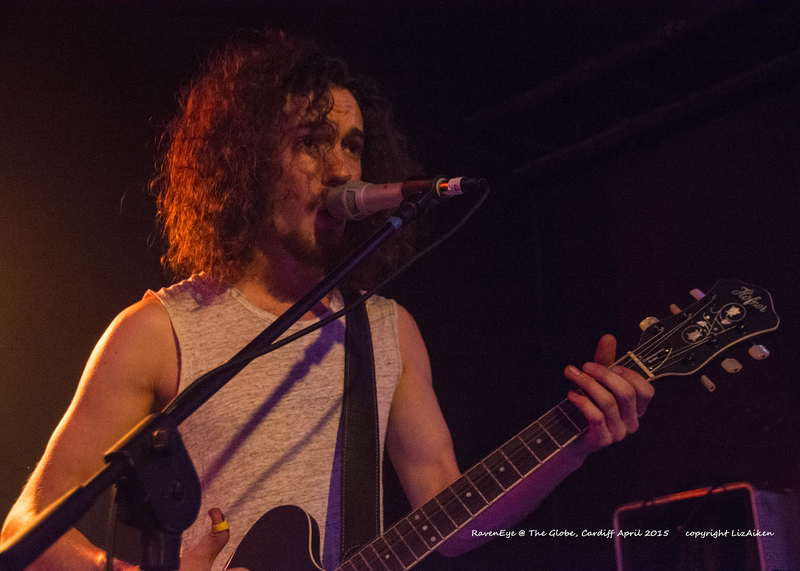 Phew – as we drew breath and the stage was re-organised for RavenEye, there was a lot of positive chatter about the opening act as the crowd swelled waiting for the main act. The atmosphere was hot and eager to be entertained while the impatience for the main act grew. 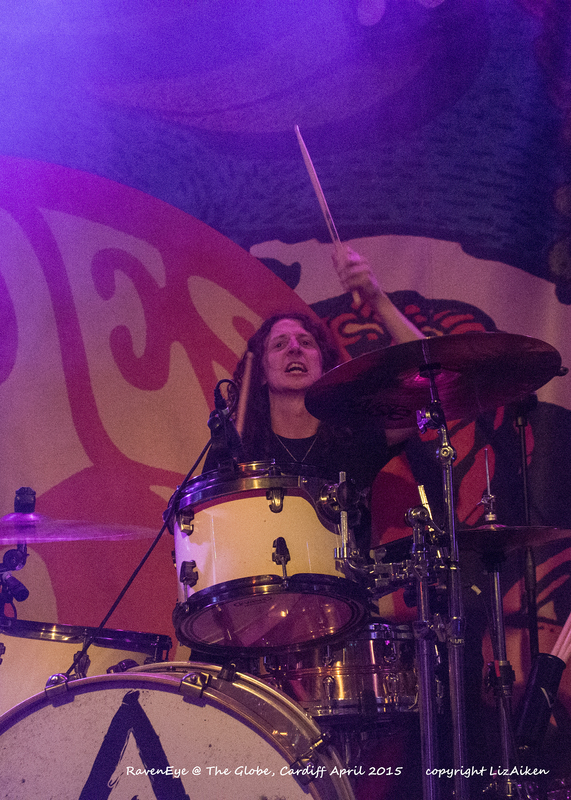 RavenEye a new band that has Oli Brown, known for the blues but can rock his Hofner guitar now joined with Kev Hickman authoritative drummer and Aaron Spiers the energetic bass player, these are the musicians can they deliver? Yes they did they can rock any audience with a unique style that delivers every note and vocal with clarity. The music is gritty as they grind out a hefty full on rock beat and the tone is fattened out by Oli’s signature thumb pick. Oli charmed the audience with his vocals and rapport as he shared the audience with the bouncing throng happy to return the vocal back to Oli. Aaron on bass was full of energy and interacted with Oli and added another layer of tonal depth and energy the two up front were zinging; not to be left out Kev at the back twirled his sticks, and used two different stick forms making the drums sharp and muffled, at times they danced with a fluidity and then they were used with military precision to march out a beat. 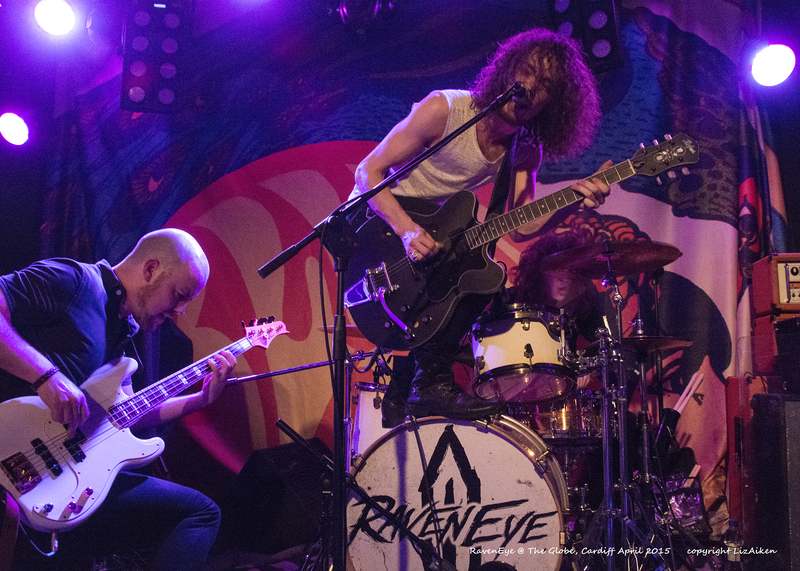 RavenEye are a trio full of power, the power to rock and delight an audience, they made many new fans and were seen by others as sharing the bill with Blues Pills. 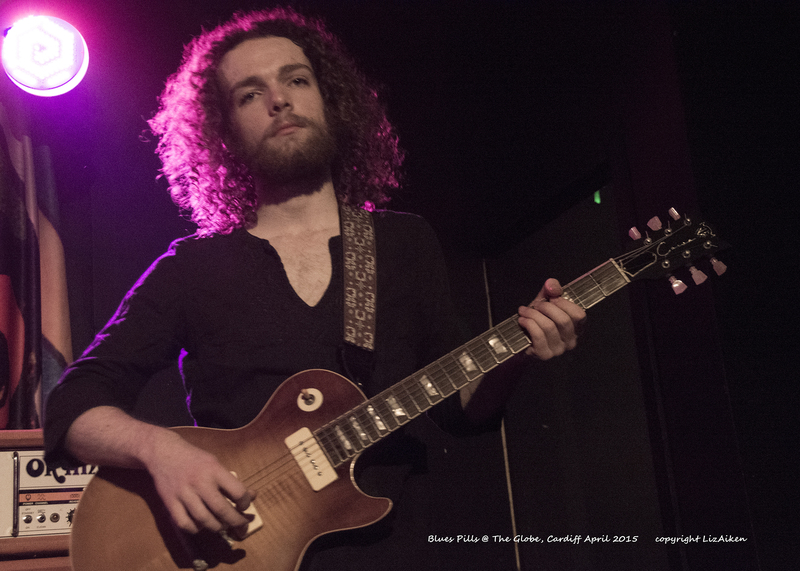 Tonight Blues Pills hit Cardiff, the second night of their U.K. leg of their 2015 Rock Revelation Tour; the venue was warmed up following the two fabulous opening bands. The stage was set for the act the drummer; André Kvarnströmoff centre stage, Zack Anderson on bass stage left and on the far right guitarist Dorian Sorriaux and the centre stage and a large space behind for Elin Larsson vocalist and dancer of the this dynamic American – Swedish – French quartet. The audience now congregating around the stage were diverse, young and older, hippy and rocker as the mood and atmosphere took a step back in time to the early 1970’s; it was the setting of the stage, orange amplification and the music being delivered, that said this was a modern sound a blending of retro and now that really worked. microphone and using the stand as a prop the crowd went wild. The tempo was at times frenetic, vocals leading the music then the stylish guitar solo’s from Dorian and then it was time for the rhythm section to shine in the sun. 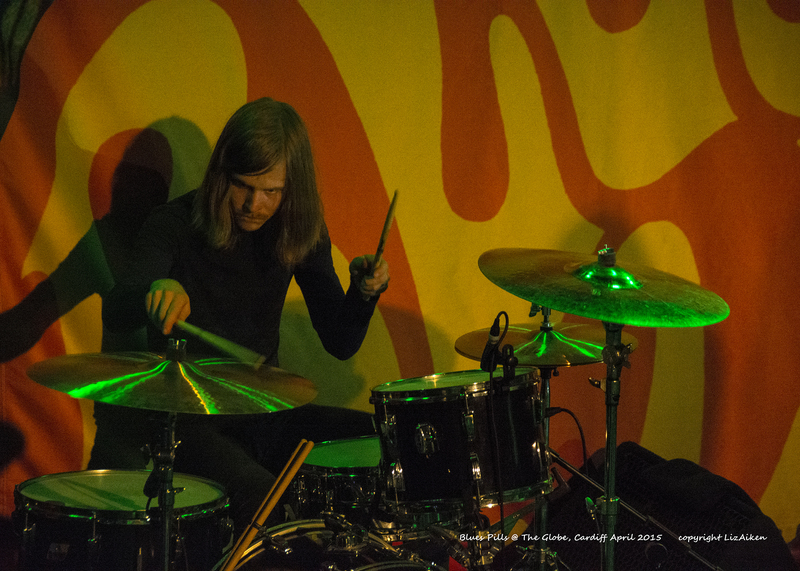 Dig In was a slower number adding a beat that drove through the audience thanks to the bass and drums. 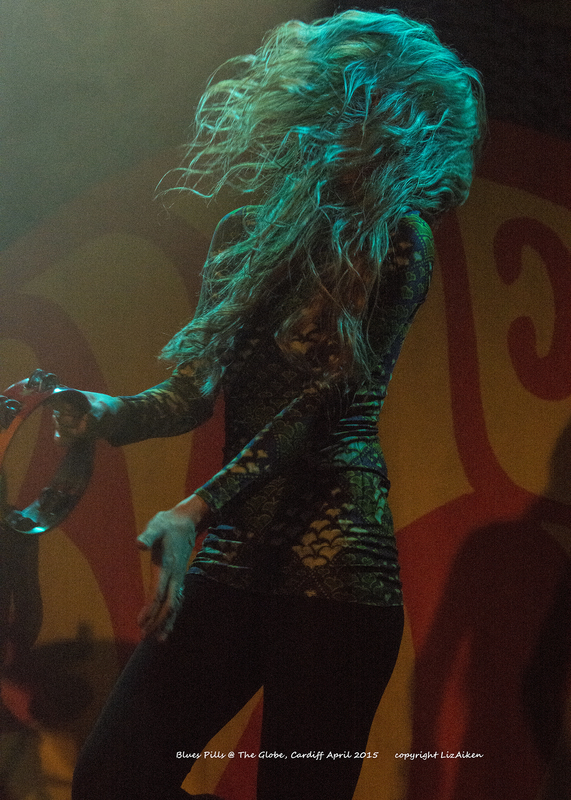 The dancing was wild the audiences hair flew back and forth as they were absorbed into the musical contours that are Blues Pills. There was the magic of four musicians who understand each other’s talents and wanted to celebrate in a collective delivery of a sound that is simply Blues Pills. The music at times shimmered with forgotten memories and a riff here and a mixing of notes there as the sound of Black Sabbath, Free and Led Zeppelin were hinted at and then back to the core that is their own due to the deliver and the understanding that you need to add space between the high-octane, high-volume rock being delivered. endured and mesmerised, as she drew breath and danced Dorian took over with solos and lead breaks that were complex but never cluttered no extra notes were ever squeezed into any phrasing and then joining him is a swooping of Elin as the song gains energy and the music becomes all-encompassing. 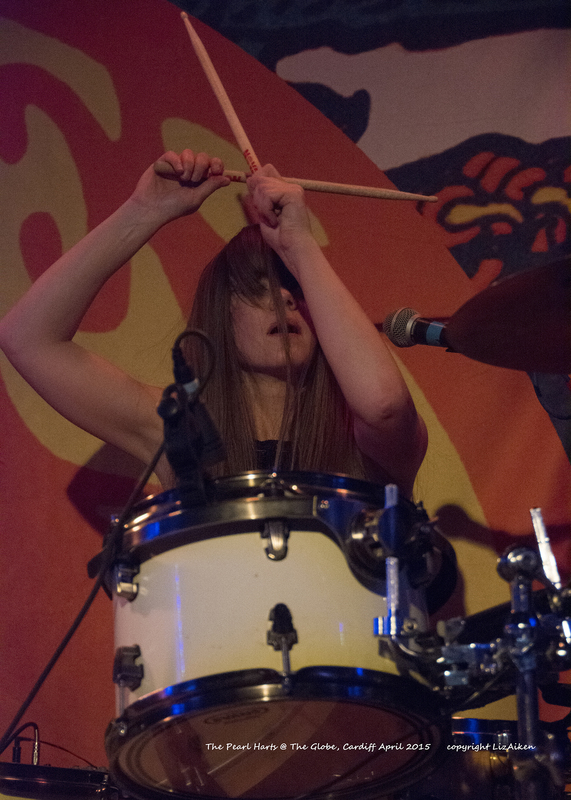 Wales was delighted to welcome Blues Pills on their first gig in the nation and we want them back very soon; delivering a special musical pharmacy of shapes, there are so many influences deep dark blues, rock, psychedelic rock and even jazz; delivered at high volume delivered with energetic pizzazz.